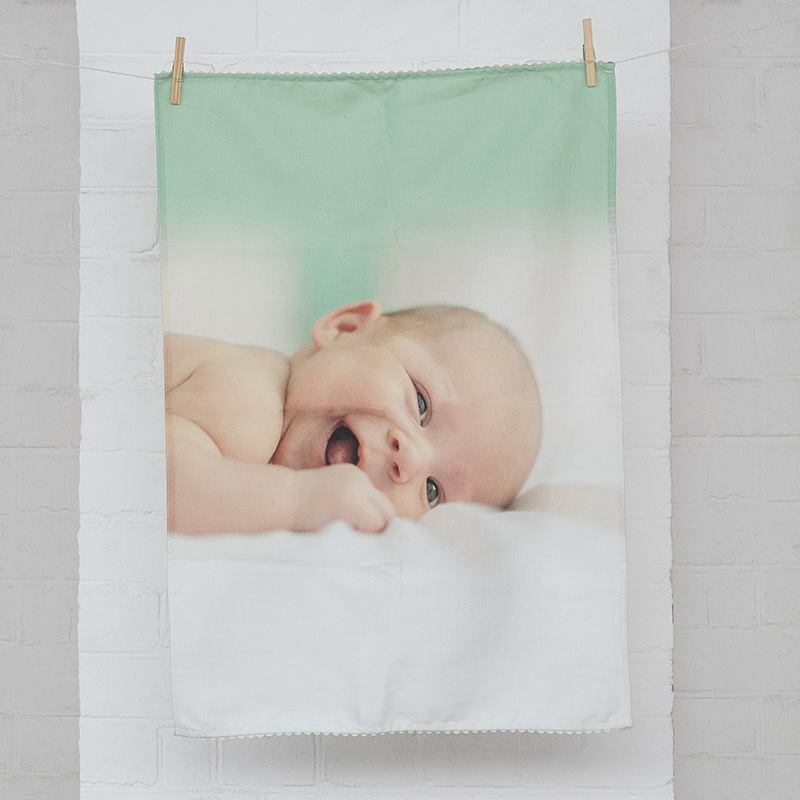 Create a custom tea towel with pictures of friends, family, or a design of your own. Available in Cotton Linen, create a custom kitchen towel to give as a gift or to fit your kitchen's style. Also known as custom tea towel or photo tea towel due to a craze started in England. Design yours online now with our easy to use design tool. Size Size: 27.5" x 20"
A kitchen towel is an essential piece to any kitchen. The uses of them vary, from wiping down the counter tops, using them with hot pans, and the biggest use which is drying dishes. With Bags of Love you can create your own personalized dish cloth, creating something unique and special. Do you have certain cloths for specific uses? Why not create a custom dish towel in the design of its use? Make kitchen time fun with towels designed by you for your kitchen. Have other designs in mind? That's no problem, our easy to use online design system will make it easy for you to create the personalized kitchen towel you want. You can even add up to 20 photos to your custom kitchen towel and create a collage design. It came out perfect. The towel felt and looked great. The black and white photos on the kitchen towel were very clear and well-done. The finished product was just as I hoped it would be. Excellent! Ordered 4 linen kitchen towels. They came out stunning, and were done and shipped so quick! Pricey, but excellent work! We hear great things back from our customers about what they do with these kitchen cloths and drying up is not their only purpose. For example many people say the cloth is too good and they use it as a wall hanging, table runners, kitchen wall art, computer monitor covers, and dining table display. Enjoy Cotton linen when designing your custom dish towel. Use this perfect material for wiping up spills, cleaning off counter tops, and is ideal for drying as the material soaks up water and dries out quickly. Our specialized printing technique, allows us to print deep, rich and vibrant colors onto your personalized kitchen towel. Your design, photo, and images are sure to pop on your custom dish towel. Create your own personalized dish cloth with no minimum and add a piece of art that you can use to your kitchen. Care: Cotton-Linen tea towel: machine wash cold (delicate setting), or better still hand wash. Dry flat. Follow the care instructions to ensure lasting colors for a long time. Guarantee: *2 year guarantee on sewing. Please note: A small barcode will be printed on the reverse side of the kitchen towel, but this will not affect the quality of your kitchen towel. Here, at Bags of Love, we print and make everything here with the latest in digital printing. So tea towel printing is at your disposal. Get inspired and create your own personalized cloth towel. Express delivery in one to two days for a tea towel. Make your own tea towel or personalized tea towels with photos words or text. Make your own design in our online design system and enjoy the creative tea towel design experience we offer. Create personalized tea towels with Bags of Love as a special gift idea for someone. Print tea towels with your photos on. Our tea towels will accept a beautiful photo print. You can add words too. The processed photo tea cloth is deep fiber printed and means it can be washed, and it also means it will soak up water, unlike most other photo tea towels. Design your own tea cloth for a show, event, or personalized gift for someone special. If you like to make customized and bespoke products then this custom tea towel is a great choice. You design it online, then we print the textile, then we cut it and hem on all four sides. Make something out of the ordinary and design personalized tea towels for your relatives. Short of gift ideas for someone? Why not make your own personalized cloth and present it as a special gift, perfect for teacher end of year present! Seasonal tea towels are a great idea so constantly refresh your kitchen in a small way. Use bright colorful images throughout the summer, pinks and blues throughout spring, reds and browns throughout autumn, and create personalized Christmas tea towels for the winter time. With personalized seasonal tea towels, you can create something that is perfect for your kitchen as well as something that changes with the weather. Tea towels are incredibly versatile. You can cover a meal, use as a placemat, take on picnics, have as a decoration on the shelf or inside cabinets, serve warm bread under (Bags of Love favorite! ), or use as a table runner. You can, of course, use them to dry fine china and glasses. Our tea towels are excellent for drying wine glasses and leave no fibers, unlike most regular tea towels. We may have the highest tech tea towel ever because it is digitally printed, and is made of high tech fibers with minute holes in the core of the fiber that soaks up the water. Personalized aprons with photos or text. Edge to edge printing. As worn by domestic goddesses and gods up and down the land. Create personalized photo glass chopping board makes a great home gift and worktop saver for you or someone's kitchen.